Turn off that chatter, will you? I have seen people go on maun vrat when they just stop talking. They continue however to communicate in other ways – gesticulating and using sign language, even showing anger and upset through signs! In addition, they write notes, use sms and mails. How can it be called maun vrat if one is still ‘talking’ albeit without using the spoken word? If one wants to be silent, it is not enough to just be in a silent place like the mountains, for instance, but one needs to stop all communication – completely. And this includes even thinking. Talking of thoughts, I recently read here that we have tens of thousands of thoughts every day. The number in different sources varied anywhere between 20000 to 80000. That is quite a lot, you say? Not actually. If you just devote some time to monitor your thoughts, you will realise how many of them flit through the mind. Not only do thoughts chase each other at lightning speed, but how quickly they lead from one thought to another in a virtual ‘chain’ is no less amazing. If you take into account the number of thoughts that go into each small action, it can make your mind fairly boggle. I tried a simple exercise the other day while making rotis. While my hand was working automatically, my mind was busy chasing thoughts in a seemingly endless pursuit. I pulled the reins in and began paying attention to them: It had started with the acrylic rolling pin and board that I was using. I had bought them in a certain shop in Delhi and that led me to the thought of my friend admiring it and asking for half a dozen of them. This led me on to the memory of hunting for them in various shops and how at one shop the shopkeeper was rude to me and that in turn set me off at a tangent of how someone in the service industry had no business being rude and on to recall my aunt telling me how sales people abroad are very polite. And then I was back in my childhood, visiting that aunt and eating a mithai she had made…But all while the mind also remembered to instruct my hands to roll the roti perfectly, and stir the dal on the other hob….telling me that my hands were sticky with dough and so to rinse it. This didn’t include the thoughts that instructed me to keep away from fire, getting my clothes wet, etc. etc. etc. Whew! All this took between 25-30 seconds – the time it takes me to make one roti – from rolling the dough-ball to cooking the roti on the griddle to roasting it on the gas, to applying ghee and stacking it in the casserole. We all know how wasteful and completely useless such thoughts are, for they take you nowhere. Back when I used to work full time, I remember getting tired even before reaching office. And all because I used to complete all the work I had to do from the time I woke up till I went to sleep, including the work at the office which sometimes was unpredictable, adding to the anxiety quotient – in my mind! All that thinking in addition to the actual work I had to do made me bushwhacked by the time I went to sleep. This is not to say that we should not think at all. Of course, no action is possible without thought. Arts, crafts, literature, scientific inventions and discoveries, philosophy, why, even our very imagination involves thinking. Any kind of learning or problem solving also need us to think. But since thoughts also include mindless thinking, delving into the past and dreaming of the future, judging people and events, forming opinions, allowing our egos to be hurt… etc etc., we need to consciously put a stop to them. Most of the time, such thoughts are not only unproductive, but also harmful to us in small and big ways. It is imperative to confine the thought process to the issue or problem at hand. This is not to say that one shouldn’t hark back to the past or dream of the future. Sometimes we need to evaluate a certain event in the past to formulate our action in the present or future. Likewise, planning for the future is also necessary, which involves some action based on our thought process. It is only when we think of the past with regret at mistakes made and are fearful of the future that useless thoughts crowd our head and rob us of our present moment. So, when the mind begins its aimless wandering it needs to be reined in. Which is why being centred on the task at hand is stressed upon in Zen Buddhism. I remember reading about a Buddhist monk who worked from morning till night cooking and cleaning for the inmates of the monastery. When anyone asked him what he was doing, he replied with what he was doing at that moment. ‘Chopping cabbage,’ or ‘washing the rice’, or simply ‘walking to the well.’ Now, if someone were to ask me what I was doing in the kitchen, I would have said, ‘Cooking lunch’. The difference lies in the way we think. While the monk did one task and thought only of that one task, I included a hundred tasks involved in the one word ‘cooking’. So while my mouth spoke the word, the mind was already racing over all the little and big tasks that constituted cooking and thousands of other ‘chains’ thoughts’ besides. And before I would know it, the subzi would have burnt! I bet the monk never burnt a single dish in his life! I recently began reading Silence by Thich Nhat Hanh, the renowned Vietnamese Buddhist monk and Nobel Peace Prize nominee. Having read other books on Buddhist philosophy, and having heard his talk, I picked up this book with considerable excitement and am hoping that at least some of the wisdom seeps into my consciousness! Hanh speaks about silence, not just outside but also inside our heads as being necessary to connect with our consciousness. Instead, the mind is constantly working and generating noise, which Hanh calls Radio NST (Non-Stop Thinking). We need to learn to switch off Radio NST. It is not good for our health to consume from our own consciousness this way. According to Hanh, we should live in the moment – much like the monk who cooks in his monastery. He gives the example of walking. If one’s mind is whirling with thoughts, the walking is done mindlessly. Mindful walking would mean that we feel our feet on the ground, look at the trees and listen to the birds while smelling the flowers – in short, living in the moment. Just as I would have felt the dough squish through my fingers and feeling the heat of the tawa as I flipped the roti and then saw it fluff up on the flame while smelling the fragrance of the freshly made roti — had I only been mindful of the act instead of letting Radio NST blare inside my head! What a waste! Not for nothing did our elders say that the mind is like a monkey that can’t stay still. 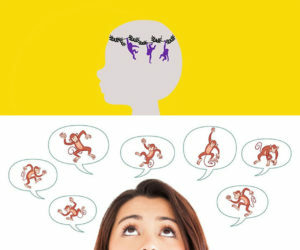 But the monkey can be made to behave and sit still with the help of mindful activity, and something as simple as mindful breathing. Remember I said, I’m reading ‘Silence’ by Thich Nhat Hanh? Once I complete it and feel confident about sharing my takeaway from it, you can expect a post. This is one of my favourite subjects and you’ve handled it so beautifully, Zephyr! I love the clarity with which you speak of stilling the mind and letting mindfulness take over. It’s tough, no doubt but definitely doable, at least in small doses which we can increase with time. In addition, I think my generation also needs to tone down the influence of outside noise, online and offline. It adds to the unrest in the mind and serves no purpose. I began re-reading the Sai Satcharita this week and it’s such a peaceful, calming work that my mind is happy when I do it. Probably a sign that I should do it more often. Thank you Shailaja, for appreciating the post 🙂 We all need to reduce external noise, why only your generation? In fact, yours seems to be the most sensible one, considering that the older generation spends more time in cyberspace (I don’t, by the way!). Reading spiritual texts can be véry rejuvenating and Sai Sat Charitra is special indeed! Glad to know you like reading the volume. Chanting is equally calming. I can vouch for that too. I laughed at myself while I reach middle of the post as my mind wandered here and there at almost every sentence. What a brilliant machine God has created, speed faster than any other man made machine. I never thought on the lines of mindful walking but yes, I do enjoy nature on my morning walk rather than switching ON Radio NST… what a nice name. Lovely read as always and full of food for thought. Do share some excerpts form the Book as I am not very good at book read. I have heard of this Author multiple times and curious to know his writings. Looking forward to read those posts. Even I loved the term Radio NST 🙂 This book is written very simply and divided into short chapters for easy understanding. You could give reading this one a try! I will share some quotes and excerpts when I hopefully write about the book itself 🙂 In the meanwhile, I share some passages from the book on my FB timeline. Do check them out. Thanks for sharing the post, Upasna. Parts of this post could have been an excerpt from my own life, Zephyr. I’ve been having issues with anxiety because of all the fearful mental chatter I’ve been experiencing later, in the form of negative self-talk, worrying about things that haven’t happened yet, etc. So I agree with Hanh’s Radio NST concept and how harmful it can be to our mental, emotional, and physical health. Now I’m working on strategies that can help me be more mindful and present in the “here and now,” rather than focus on things that are beyond my control. It will be a long process, I’m sure, but I need to try it for my own sake. Hey Sara, nice to see your here! We are all alike in some way or the other – the common thread being that we are all humans 🙂 So if the malady is common, the remedy can be a common one too! Sometimes it is not even negative talk, but just useless unproductive thoughts that do no one any good. Do read Hanh’s book if you can get it. It is worth it! That’s so sweet of you Sara. Thanks a lot and take care. This is one book I certainly want to read. Another one I read which impacted me was “Mindfulness in simple English” by Gunaratana ..A Sri Lankan monk. But I tend to forget them after a time and tend to lapse into my old ways of a chatterbox mind. So need to read them again and again and again.. It often happens with me. I have such a tough time battling such counter-productive thoughts. But, meditation has helped me a great deal to concentrate. I think going on maun mode can help one a lot. Yeah, there are people who go on uninterrupted. But Vishal, concentration while meditating is counter productive too. You have to suspend thoughts completely to be able to meditate and when we concentrate, we are just allowing focused thought on something, isn’t it? It would be be the best thing to suspend not just talking, but also other forms of communication like chats, texting and mails – all forms of internet, in short! tasyaham nigraham manye vayor iva su-duskaram. Meaning:For the mind is restless, turbulent, obstinate and very strong, O Krsna, and to subdue it is, it seems to me, more difficult than controlling the wind. And in return Krishna says ‘Abhyasena tu kaunteya’ meaning that only with practise that u can conquer over the mind. And by God is it tough…. I have found that what lifestyle you follow affects ur thinking. Like if I am regularly attending classes or kirtans my mind is calm, i will be chanting or singing. If there is a gap then gone I can do world trips in a nano second. Good to have you here, Bhagya! The thing is, when try to control the mind, it refuses to be controlled. But when we just focus on the task at hand, even something as simple as sorting vegetables or measuring out sugar for the tea, it stops its wandering and behaves! Of course, reading spiritual texts, doing kitran and being at satsang are all perfect ways of controlling the mind, but we can do it even doing mundane stuff around the house. When I chant shlokas, I tend to do it mechanically since the verses are all memorised, so I try to concentrate on the verses and make out the meaning of the verses. As long as the thoughts turn into some form of creative output, it is still ok. But most often, they don’t get converted into creative writing, right? So pull yourself up short and begin concentrating on the task at hand or if you are idle, learn to do NOTHING. In the meditation of Sri Sri Ravishankar, he asks us to say, ‘I want nothing, I will do nothing, I am nothing.’ It is a perfect way to be thoughtless while meditating! A very useful post for today’s times. I am often pulled into doing so much in my thoughts just like you mentioned. It is exhausting. 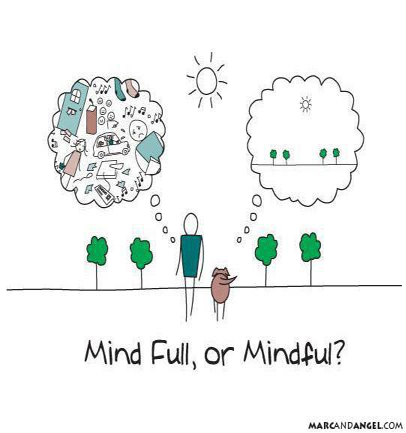 Being mindful definitely helps but sometimes the mind just keeps racing. Constant struggle, I tell you!